Featuring costume jewelry by Joseff of Hollywood, advertising pocket mirrors, Victorian mourning jewelry, and art pottery, Kovels' February newsletter is full of photos, information, tips and prices. 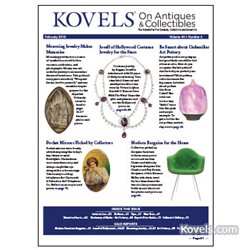 Kovels on Antiques & Collectibles newsletter is available in print and digital versions. Costume jewelry and accessories by Joseff of Hollywood were featured in a sale report in Kovels on Antiques & Collectibles February 2018 newsletter. More than 600 Joseff pieces spanning 90 years of Hollywood movie history were offered at the California auction. A pair of gold-plated filigree earrings with simulated diamonds worn by Marilyn Monroe to promote Gentlemen Prefer Blondes took top lot at $112,000, proving that jewelry sells higher if worn by a famous actor or actress. See pictures and prices of Joseff jewelry worn by Vivian Leigh, Shirley Temple, Mae West and other stars. Mourning jewelry sold for high prices in a Pennsylvania auction where prices peaked at $35,000. For hundreds of years it was carried or worn to remember departed loved ones. Kovels’ February issue pictures the top-seller along with other pins, pendants and bracelets with symbolic images like funerary urns, skulls and weeping willow trees as well as portraits, verses and locks of hair. Small pocket mirrors were useful and popular advertising trinkets given out by merchants and vendors at the turn of the 20th century and are popular collectibles today. Many sold at a recent New York auction from $30 to $3,000, and colorful examples are pictured with prices in Kovels’ latest newsletter. Art pottery was auctioned in Cincinnati and pieces by recognized makers continue to rise in price. Kovels’ February newsletter offers pictures, prices and tips to help readers recognize smaller or lesser-known potters whose work can still be bargains at house sales and flea markets. And collectors picked up designer furniture for dorm room prices at a recent St. Louis auction. Chairs and tables by big-name designers sold for less than dinner for two at a fancy restaurant. Find pictures and prices of modern bargains in Kovels’ February newsletter. To celebrate Valentine’s Day, Kovels’ pictures some famous heart-shaped items from a Bakelite pin to a pricey ice cream scoop. The popular illustrated Collector’s Gallery answers readers’ questions about a Staffordshire platter, Benedict silver plate, an old Holloway’s Ointment pot and a set of juggler’s clubs. The February Dictionary of Marks lists American art pottery makers. And more than 70 antiques and collectibles are listed in February’s Buyers Price Guide.